This years winner of the CIADA Community Service Award is an active dealer in all of the communities he serves. 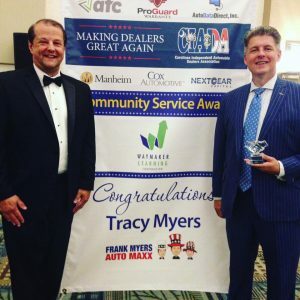 Tracy Myers, owner of Frank Myers Auto Maxx in Winston-Salem, NC, has been a leader a giver in the community, always giving back when he could and never asking for anything in return. In 2011, many say he outdid himself when he had the vision to take his passion for sports entertainment (also known as pro wrestling) and use it to raise money to help provide toys and Bibles to less fortunate children during Christmas. He created the WrestleCade fundraising event which partnered with The Christmas Toy Drive to benefit The Salvation Army. This is just one of the many ways Tracy is involved and gives back to his church and his community. CIADA is proud to announce the 2017 Community Service Award Winner: Tracy E. Myers, CMD owner of Frank Myers Auto Maxx in Winston-Salem, NC. The CIADA Community Service Award is sponsored by Waymaker Learning Corporation. CIADA Strived to encourage its members to be active in the communities they serve. An active community benefits when businesses give back, and our businesses benefit from a prosperous community.